Start planning your garden well in advance so you will be ready to get to work when planting time arrives. It is best to lay you new lawn as soon as it arrives. It is essential to measure the area in which your new lawn will be laid correctly. This video Nigel Ruck demonstrates how to measure how much soil and lawn you’ll need to cover your lawn area, including irregular shapes. It is important to prepare the existing ground ready for the installation of your new lawn. The step by step guide and video below will ensure you get the best results when laying your turf. Completely clear the area to be turfed of rocks and other debris. Remove existing lawn and/or weeds. The easiest way to do this is by using a Knapsack Sprayer using Glyphosate (Roundup or Zero) no less than 14 days before laying new turf. The recommended rate to mix will depend on the particular product purchased. Rotary hoe or till the soil to a depth of 100mm. Assess soil type and condition. If the clay content in the soil is high add Gypsum. Test the pH level of the soil and if less than 7.0 add 500grams of lime per 1m² and incorporate into the soil. Continue to rotary hoe or till the soil to an even consistency. Rake over to achieve a smooth surface and remove any further debris that may have been brought to the surface through rotary hoeing. If the existing soil is not deep apply a good quality sandy loam (weed free) turf underlay consisting of 60% sand and 40% soil. The underlay should be laid to a depth 100mm and kept 25 – 30mm lower than paths, paving, driveways and mower strips to allow the turf to finish at the height of the path. Apply Sir Launcher pre-lawn fertiliser to the underlay and lightly rake in. 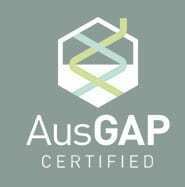 Use rake or timber straight edge to achieve final levels and grades. Take extra time to ensure an even surface as this will result in a better appearance and a more even mowing surface. If required, roll surface and regrade levels. A good quality soil is desired to achieve the best lawn. The Sir Walter root system has been found as deep as 600mm in good soil. This is why it has such good drought tolerance as the Sir Walter roots can access all of the moisture in a good deep soil. Try to lay the turf within 24hrs of delivery. If turf cannot be laid immediately after delivery ensure that turf rolls are kept moist and in the shade. The soil should have a degree of moisture content. Not too wet or dry. Start from the longest straight edge e.g. driveway, path, paved area or fence. Roll out turf and make sure all joins are butted tightly together with no overlapping. Rows of turf should be in a brick pattern when laid to reduce the incidence of water erosion especially on steep slopes and grades. If laying turf on slopes, lay rolls across slopes rather than down. If slopes are very steep you may need to hold roll in place with a stake until root growth stabilisers turf roll. Cut turf roll with a sharp knife or spade when laying around odd shapes, trees or garden beds. Smooth out any air pockets in the turf by rolling or tamping to ensure that there is good contact between the roots of the turf and the soil. A light top dressing may be applied after laying to fill joins and level any depressions. Washed river sand or turf underlay should be used for the top dressing and should be no more than 10-12mm thick. The leaf of the turf should be visible after top dressing. The turf will require watering immediately after it has been laid. The turf needs to be soaked but not saturated. After the initial watering, depending on Sydney Water exemptions and restrictions, the turf should be watered early morning and afternoon and kept moist for approx. 14 days. After the first 14 days you should notice that the turf has taken root and cannot be lifted. At this stage watering can be reduced to every second day depending on the weather for a further 7-10 days until it becomes an established lawn. Once the lawn is established, one of the most important things to remember is not to over water. 15mm of water once per week is usually adequate to keep Sir Walter in a good condition. To ensure that the roots develop a deep root system well it is better to apply one deep watering in lieu of frequent shallow watering. 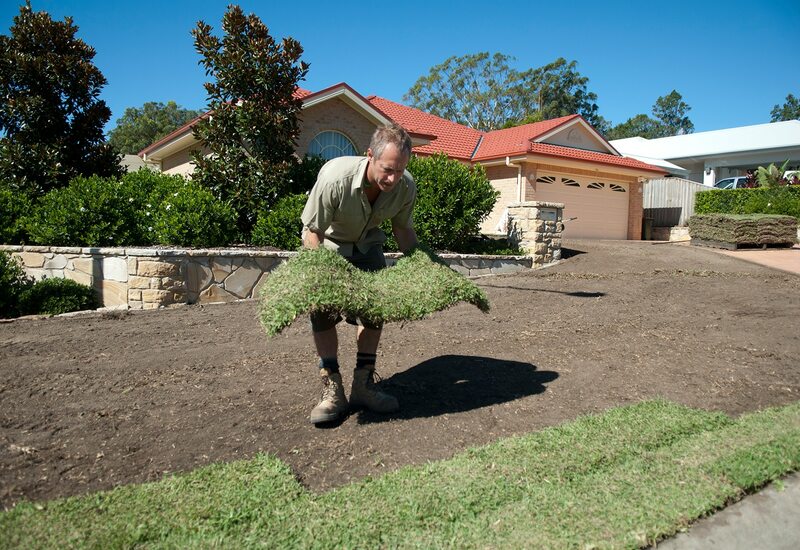 In an average Sydney summer you should apply 2-3 deep waterings a week to an establishing lawn and 1 per week in winter depending on conditions. The turf roots should have established in about 14 days in warmer weather. You can test this by lifting the turf slightly and the turf cannot be easily lifted – the first mow should be left until the grass blade length is about 60-70mm in length. Prior to laying, the soil should be fertilised and again two weeks after installing, then every eight weeks for the first twelve months. Correct fertiliser recommendations vary depending on climate, region and soil type. Generally a slow released balanced NPK lawn food is best, such as Sir Walter Fertiliser. It is best to spread your fertiliser with either a hand held spreader or a push along spreader. See our online store for our fertiliser spreaders. Grech’s Turf provides the highest quality turf at the best prices!